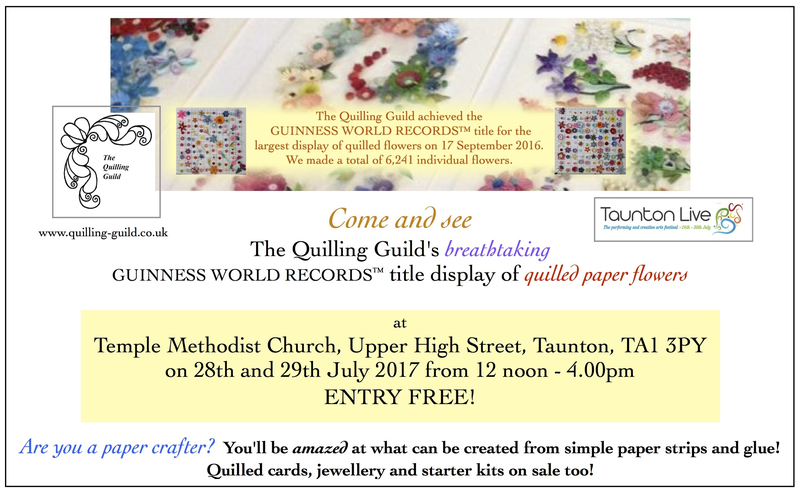 Counting down to Taunton Live 2017! 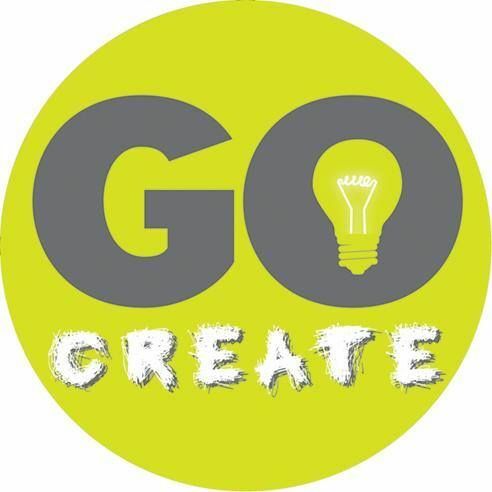 Just a few weeks to go now before the start of this year’s amazing Taunton Live Arts Festival on 24th July and things are hotting up in more ways than one! I have created a page on this blog on which you can look at the full festival programme here. 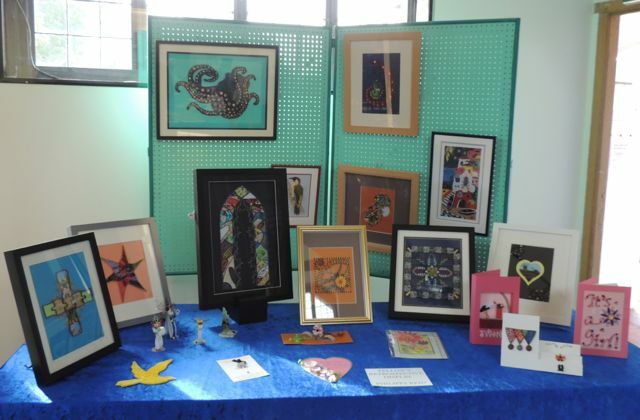 Amid blazing sunshine and soaring temperatures, I am currently putting the finishing touches to all the pieces I am going to be taking to this year’s festival as time ticks rapidly by. 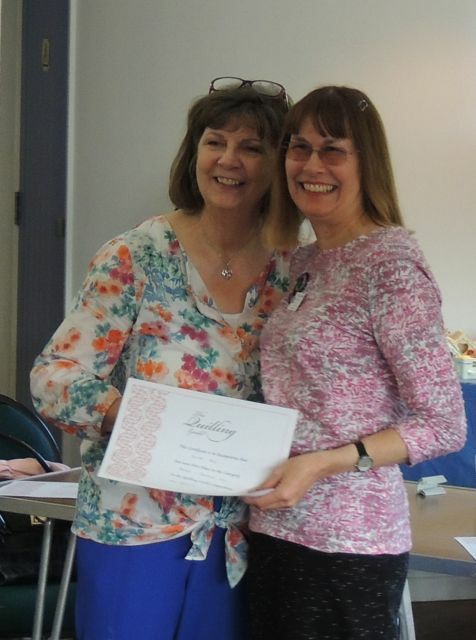 It’s hard to imagine that this year’s event could possibly be even more exciting for me than it was in 2016 (see this post which is full of happy memories) – but the signs are looking good indeed! 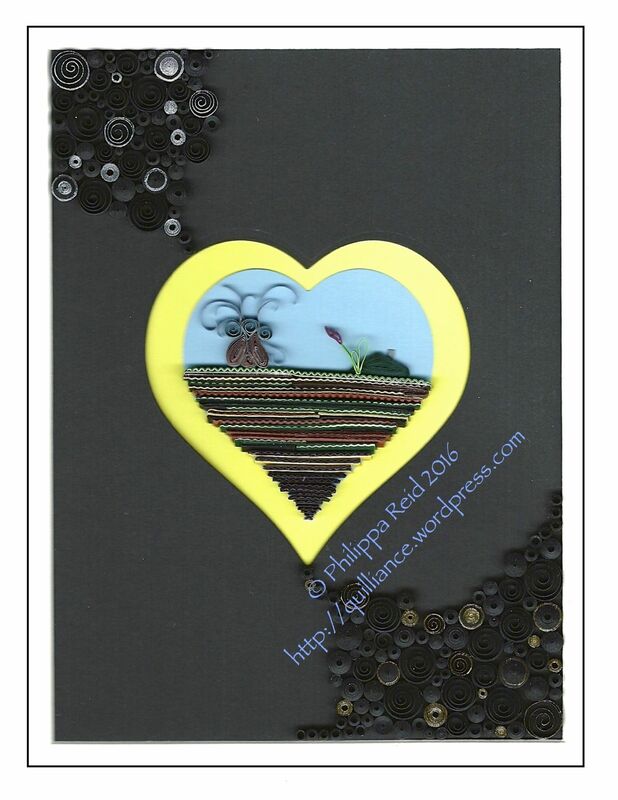 It’s my interpretation of the peat-rich flatlands of the glorious Somerset Levels, featuring quilling strip ‘strata’ and gold/silver edged coils depicting light glinting on the muddy puddles of the moorland which stretches for miles around the iconic mound of Glastonbury Tor. I also added a quilled willow tree and reeds to complete the image which for me captures just a little of the magical essence of Somerset. I hope that visitors will like it. 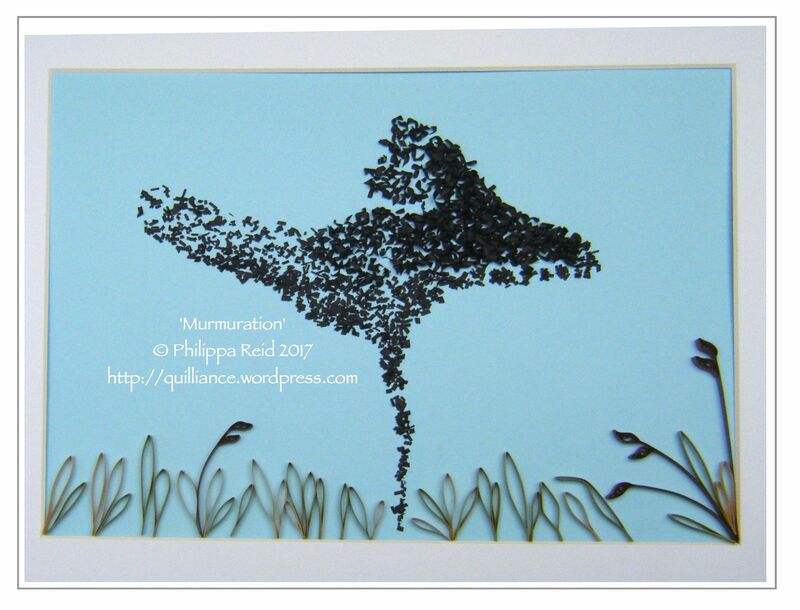 … plus the focus of my display of framed pictures on the waiting room wall will be birds. 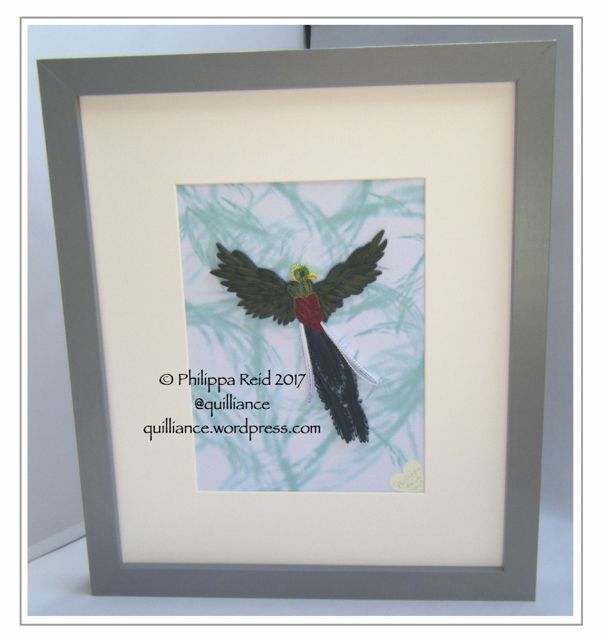 These will include my recently-framed ‘Resplendent Quetzal’ bird of paradise (pictured below), along with my quilled turtle dove, green woodpecker, and ‘murmuration’ of starlings (also below) which I created using Diane Boden’s amazing ‘fairy dust sprinkles’ technique that I learned at the Quilling Guild‘s last International Festival of Quilling in Liverpool in 2013. 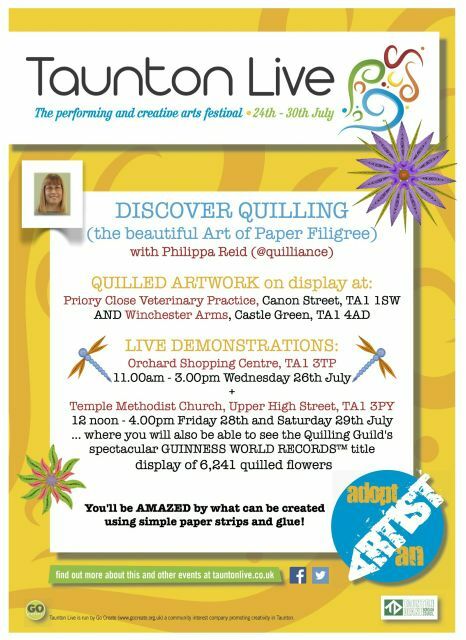 On Wednesday 26th July, I’ll be doing a ‘pop-up’ quilling demonstration in Taunton’s main shopping area, the Orchard Centre, alongside other ‘pop-up’ performances by various Go Create Taunton members. 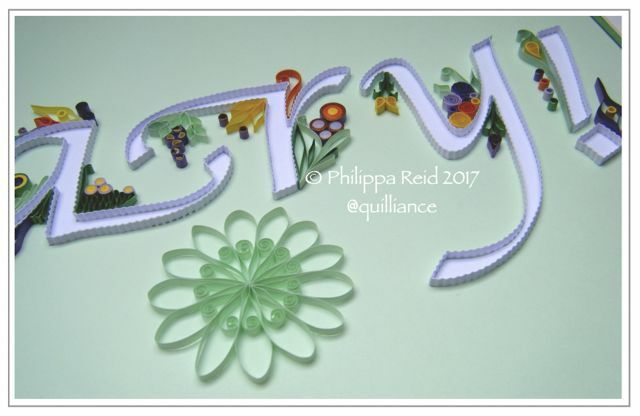 I plan to be making some quilled jewellery for the public to watch, and there will be an opportunity for them to have a go at quilling if they want to – I’ll have plenty of starter kits on standby! 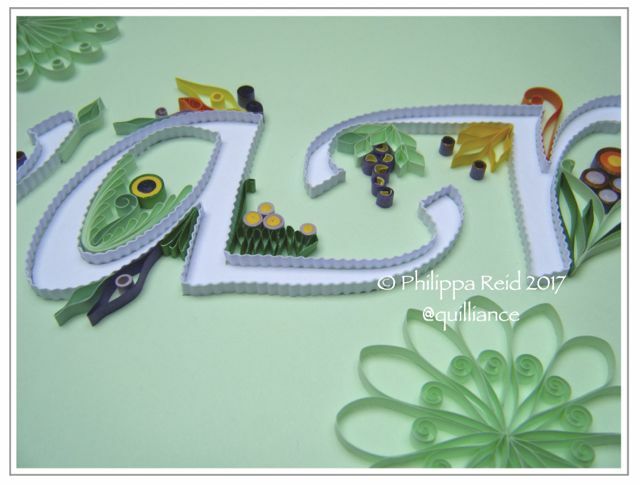 This event will also provide me with the chance to offer some of my quilled merchandise for sale – I’ve been making quite a few new cards and jewellery items this year. 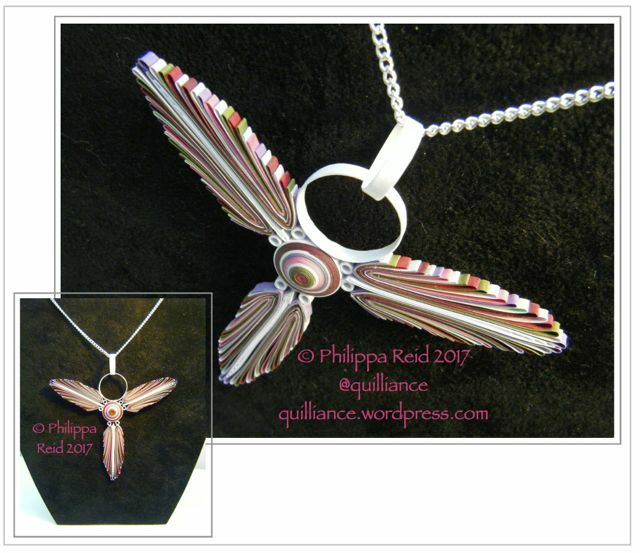 Over the months, I’ve progressed from multi-coloured creations based on solid coils to some interlocking hoop designs, inspired by some of the wonderful ideas shared by the eminent Australian paper jewellery-maker Licia Politis in the Quilling Guild’s ‘Quillers Today‘ magazine a few years ago. 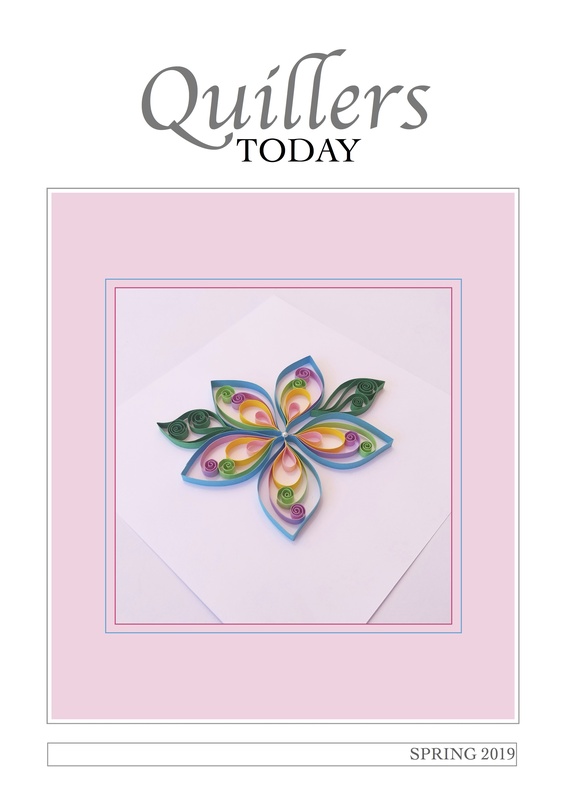 (Quilling Guild members can access this feature via the Quilling Now! blog). 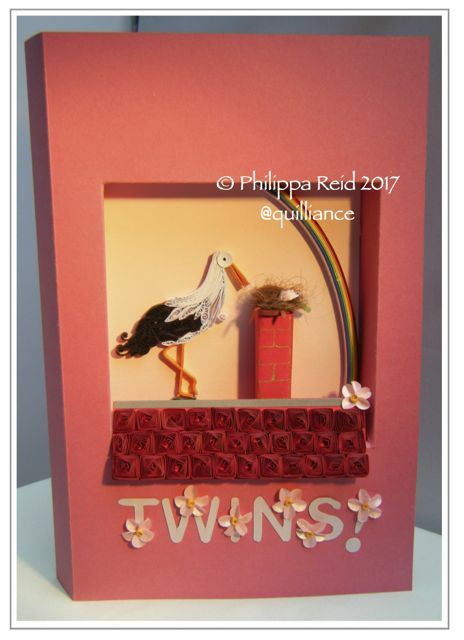 I hope that the cards I have made will prove popular in Taunton. 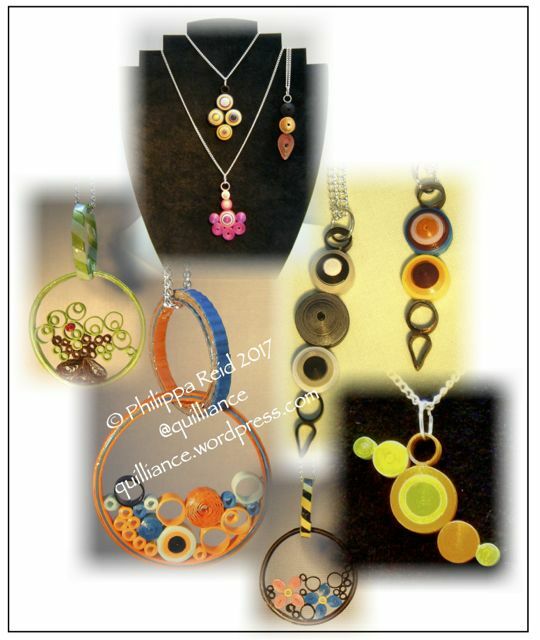 These merchandise items will also be on sale at what I regard as my ‘main event’ at the Festival: I am honoured to be hosting a display of the Quilling Guild’s amazing GUINNESS WORLD RECORDS™ title display of 6,241 quilled flowers at the Temple Church in Upper High Street, on 28th and 29th July from 12 noon – 4.00pm each day. 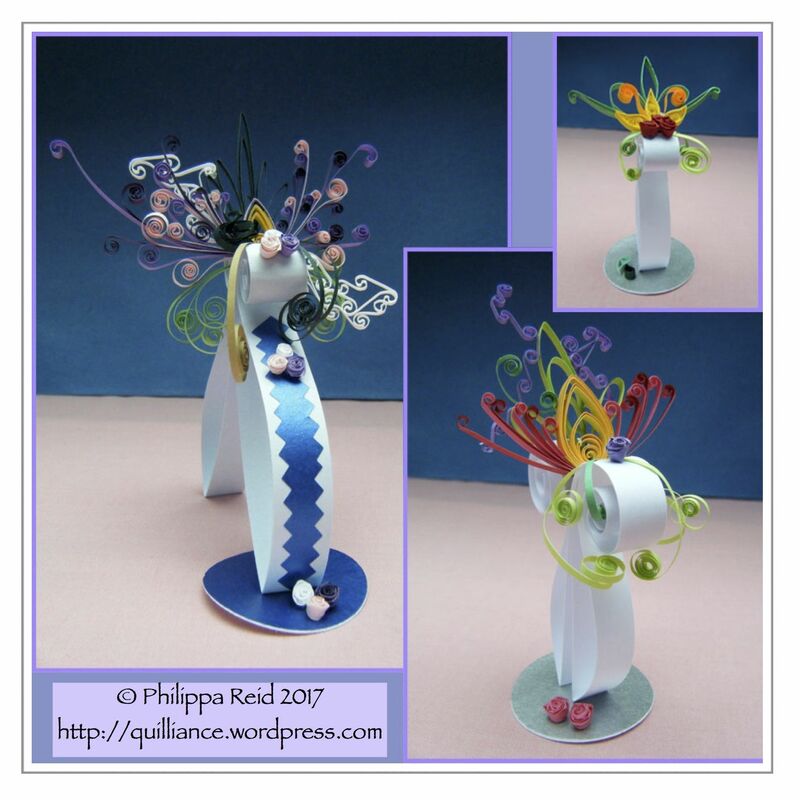 I’ll be demonstrating quilled flowers at this free event, and I’m hoping that lots of people will come to see the display which is being billed as one of the highlights of the Festival. So, with all this going on, I’m sure you can imagine my rising sense of excitement as I count the days until the beginning of Taunton Live on 24th July. If you live in, or find yourself in the area during the Festival week, do please come and see me at one of my events, and take in the rest of the Festival which will be packed with spectacular art and performances of every kind. It is my absolute pleasure and privilege to be part of it. Check out the whole Festival programme here! 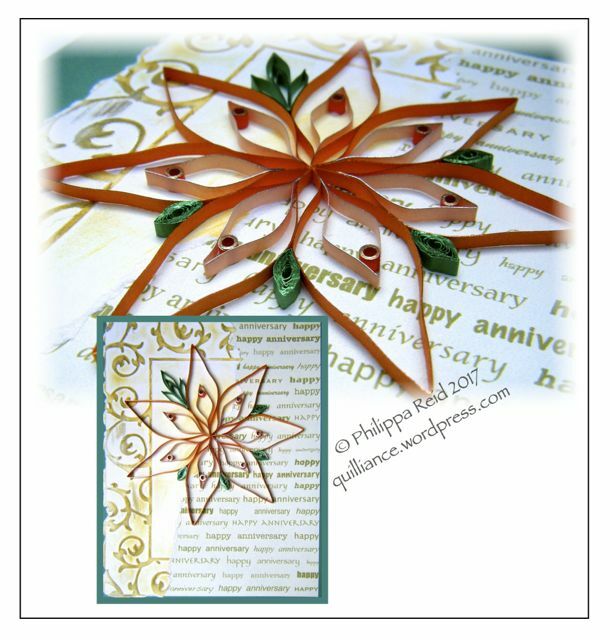 Five months since I last posted to my blog!! 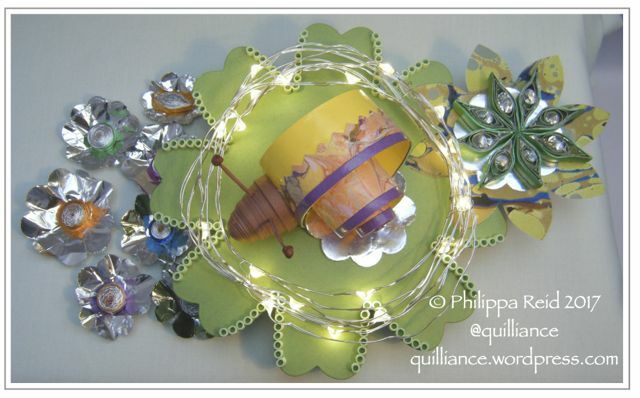 Time rushes by, and I’m kept so busy with producing the Quilling Guild’s members’ magazine and blog that my own site here remains sadly neglected. Plus to be honest I’ve been seduced by the ease of the ‘quick-fix’ alternatives of ‘micro-blogging’ on Facebook and Twitter which have become my main communications platforms in the meantime. Then there’s Instagram, too – I keep forgetting about that … when it comes to social media, there’s simply too much to keep up with! It’s February 2017, and this month I was supposed to have been staging an exhibition of my work as a featured artist at a gallery in the village where I live – except it hasn’t happened because, tragically, the gallery was forced to close last summer. There’s a saying here in the UK that “when one door closes, another opens”, however – and that’s certainly been true for me! 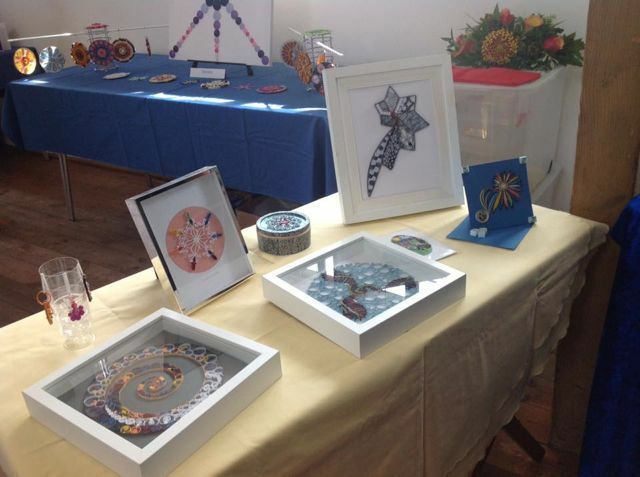 Last summer, I was privileged to be asked to get involved in the Taunton Live Arts Festival in Somerset – you can read all about it here. This enabled me to exhibit, and subsequently sell, some of my work – which more than makes up for the lost opportunity of the cancelled gallery show. Plus preparations are now well underway for Taunton Live 2017 in which I am going to be even more deeply involved this year! 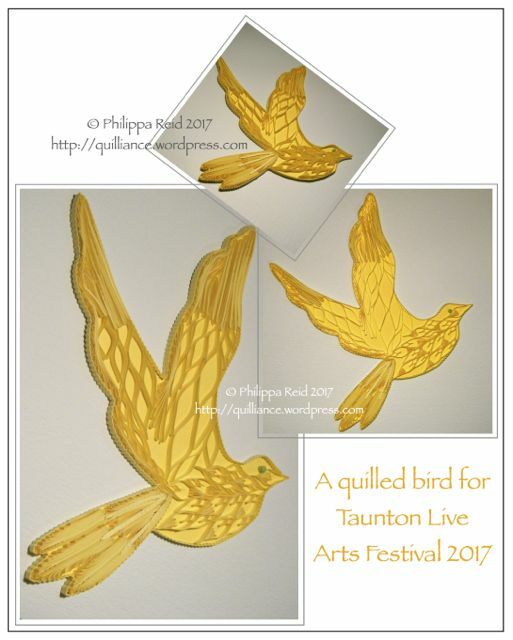 One of the festival organisers is going to stage a wall installation in the town centre, featuring an array of origami paper flowers in individual rainbow colours, and she asked if I could produce a yellow bird with quilled decoration to ‘fly’ amongst them. 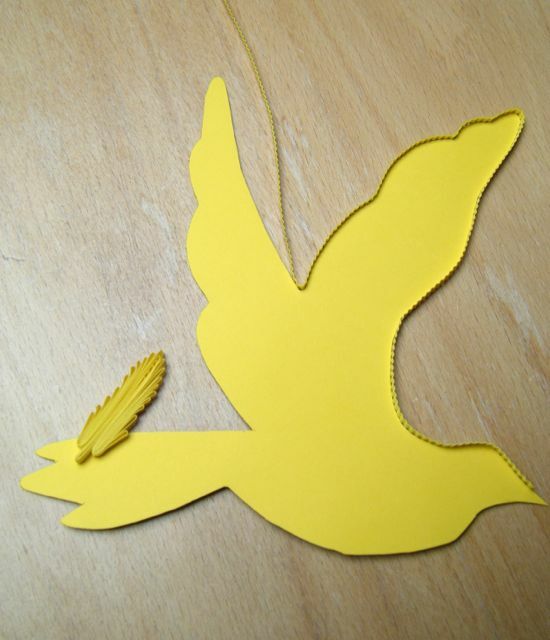 The bird had to be based on a solid cut-out background shape which can be attached to the wall by means of ‘sticky fixers’ – and it had to be flying from left to right. 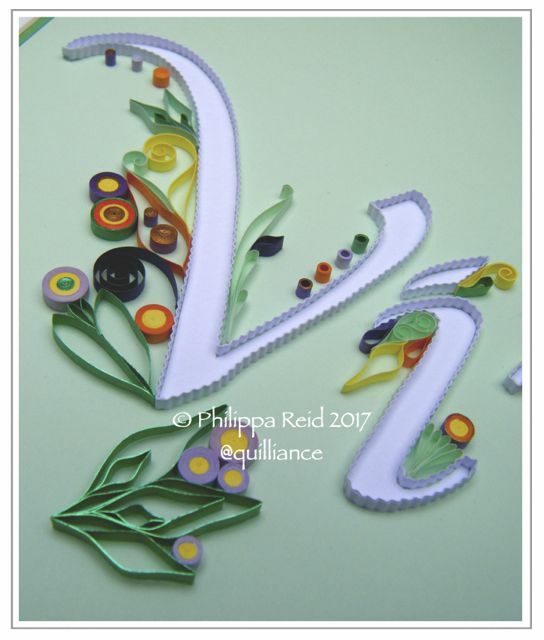 I started by cutting out the bird shape from yellow card, and edging it with a crimped border made from two 3mm yellow quilling strips glued together. 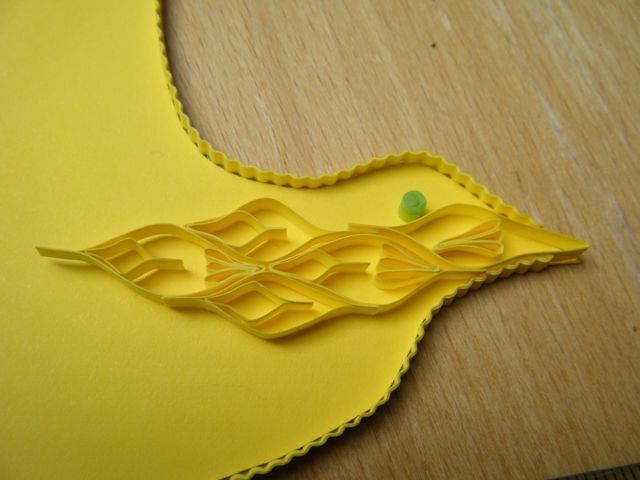 The border was attached by applying glue to the side edge of the bird shape, working from the back so that any excess ‘blobs’ would not show on the front side. 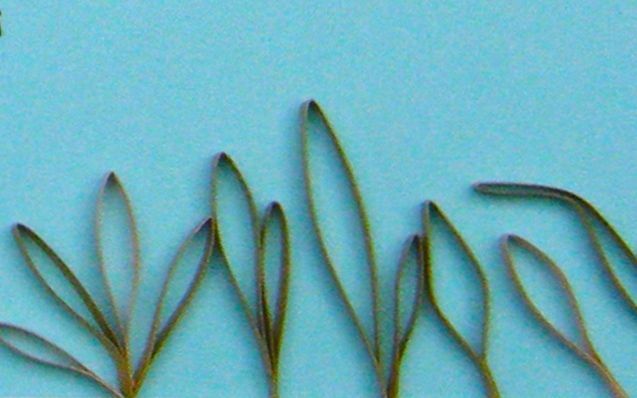 I also started working to develop a format for the tail feathers, based on a central wheatear spine bordered by two alternate side-looped huskings. I then made a radical decision regarding the way in which I would ‘feather’ the main body of the bird. 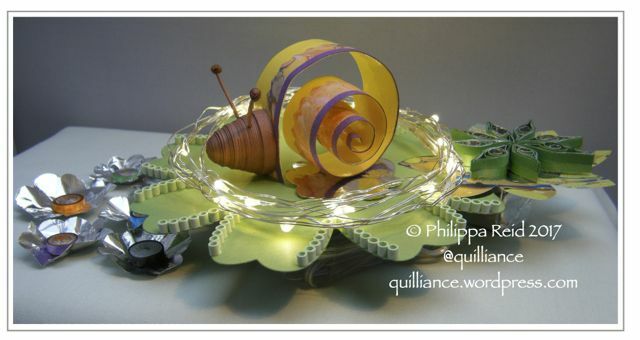 In earlier days, I would have set about laboriously filling up the space with closed loose coil marquises or endless ‘beehive’ twists made with a slotted tool – but, do you know, I am just SO bored with these popular methods of quilling infill!! Beehive, to me, is over-done these days and really rather unimaginative. 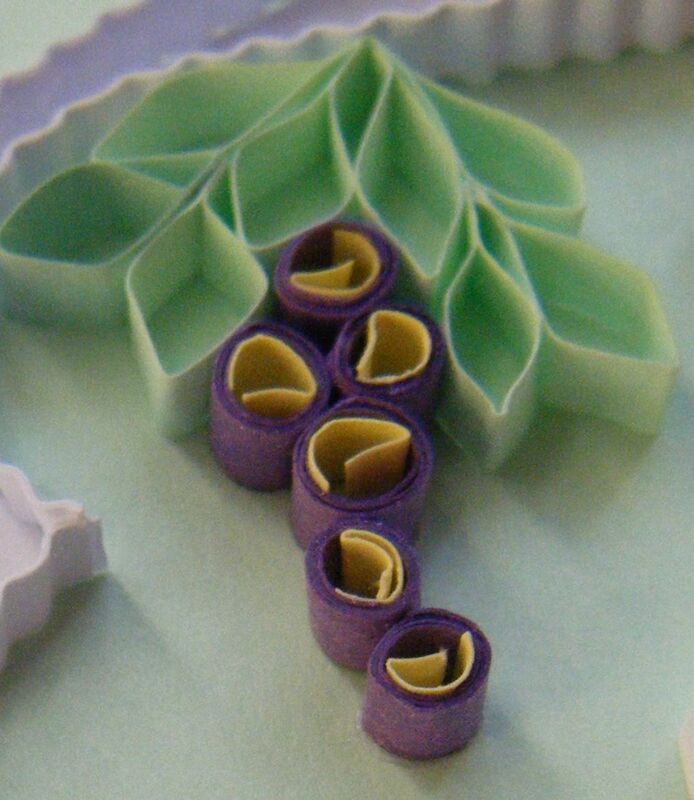 As for interlocking coiled marquises – well, not only do I find them boring to make, but I personally think the end result can be unattractively ‘heavy’ and ‘clumpy’; I badly needed to develop an alternative approach. I’m becoming convinced that making space is sometimes more effective than slavishly filling it. So I’ve used ogees for my bird, which is now flying free, and will be making its public appearance in Taunton in July.